On Friday, July 10, 2009, YMAA author Ramel Rones will present his research on the benefits of tai chi for osteoarthritis of the knee at the International Tai Chi Symposium in Nashville, TN. The world's leading Grandmasters of all tai chi styles and the foremost researchers in the medical community will gather during this week-long symposium to share ideas and research, and practice tai chi together. Ramel works at Tufts University School of Medicine as a co-researcher with Professor Chenchen Wang, MD, MSc, and their 40-person controlled study is one of the first of its kind to be published widely in the Western medical community. Harvard University's May 2009 Newsletter mentions this study and others, stating that "there is growing evidence that this mind-body practice... has value in treating and preventing many health problems", including arthritis, bone density, cancer, heart disease, hypertension, Parkinson's, and others. We are confident that this integration of Eastern and Western wisdom will continue, and as more and larger studies are conducted, the ancient arts of tai chi and qigong will flourish in modern times. You may read more about Rami's work here. 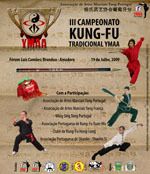 On July 19th, YMAA Portugal will host the 3rd edition of Traditional YMAA Kung Fu Championship. The event will be held at the Forum Luís de Camões (Amadora-Lisbon) and sponsored by the town hall of Amadora. Other Chinese martial arts schools in the region have accepted YMAA Portugal invitation to join the competition. As with previous times, WSTP (Wing Sing Tong Portugal), APKFXW (Kung Fu Xuan Wu Portuguese Association), Hong Long (Hong Long Kung Fu Club, Shaolin-Si (Shaolin-Si Portuguese Association), and ACLFP (Choy Lee Fat Oporto Association) will be attending. And for the very first time, students from another YMAA branch school, YMAA France, will also be competing. With this event, YMAA Portugal aims to promote competition in traditional Kung Fu, and to establish a competition event for all YMAA branch schools in the future. Noted author and Taiji expert, Dr. Aihan Kuhn, will attend a book signing event at Tatnuck Booksellers, 18 Lyman St., Westborough, Mass. on June 20 from 1 to 3 p.m. for her latest book, Simple Chinese Medicine: A Beginner's Guide to Natural Healing & Well-Being. This book is written for those new to natural healing and is based upon centuries old practice of Traditional Chinese Medicine (TCM). More information can be found on the author's website. Nationally known author and martial arts expert, Arthur Rosenfeld, will attend a book signing event at Books & Books, 927 Lincoln Road, Miami Beach, Fla, at 7 p.m. on June 18 for his latest book, Quiet Teacher, A Xeon Pearl Martial Arts Thriller. This book is the second in a series of Xeon Pearl martial arts mystery adventures, a celebrated neurosurgeon by day and a secret vigilante by night. More information can be found on the author's website. You are invited to YMAA CA and join in the training there with Dr. Yang, almost any time of the year. YMAA members receive a discount. The training is challenging, and you will learn at an accelerated rate and will achieve higher levels of skill and understanding in a much shorter period. As a visitor, you must follow the usual Retreat Center student rules and schedule. The Retreat Center offers an ideal setting to immerse yourself in training away from the distractions of every day life, with an organic garden, a Spring-fed well, and good energy deep in the forest of Northern California. Details and pricing are located at this link. Visit the all-new www.YouTube.com/YMAA page and you can watch dozens of YMAA videos of previews for many YMAA DVDs, as well as YMAA-related videos from our friends and fans around the world. Recent additions include Nicholas Yang, Kathy Yang, and Dr Yang performing Shaolin Sword Sequences and Applications, Jon Chang performing Yi Lu Mai Fu, and Zhou, Xuan-Yun at the 2009 Zhang Seng Feng Festival last weekend. 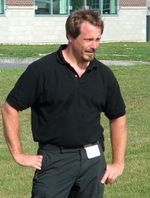 The "Application of Power" seminar by Kris Wilder, noted author and martial artists, is set for Saturday, June 13, 2009, 10 a.m. to 4 p.m. at Metropolitan Community College-Blue River campus, at the Arts & Sciences Building – Room 100 (gymnasium) 20301 E. 78 Highway, Independence, Mo. The program entails mechanics, applications, strategy, and is open to all styles. Fee $50. The seminar benefits the "Single Parent Book Loan Program" at the college. For more information contact Eric Parsons, MCC:BRC at (816) 220-6746, eric.parsons@mcckc.edu or visit www.WestSeattleKarate.com. Noted author and Taiji expert, Dr. Aihan Kuhn, will attend a book signing event at Barnes & Noble, 1 Worcester Rd, Framingham, Mass. on Saturday, June 13 from 2 to 4 p.m. for her latest book, Simple Chinese Medicine: A Beginner's Guide to Natural Healing & Well-Being. This book is written for those new to natural healing and is based upon centuries old practice of Traditional Chinese Medicine (TCM). More information can be found on the author's website. Now there's one more way to keep in touch with us at YMAA! Twitter is a very popular and fast-growing service that offers quick updates. You can find us at twitter.com/ymaadotcom. Click to "Follow" our updates or subscribe to the rss feed to know everything that is happening with YMAA every day. We'll use Twitter to inform you of news, articles, seminars, and YMAA events around the world. Yang's Martial Arts Association in Boston, Mass., celebrated this year's World Tai Chi Qigong Day event by inviting a number of other schools to participate. The event took place at the Arnold Arboretum in Jamaica Plain and was the scene of the largest gathering of tai chi participants ever. Blessed with unseasonably warm weather and a flurry of cherry blossoms from surrounding trees, everyone seemed to enjoy themselves immensly. Bill Douglas, WTCQD organizer, did a wonderful job keeping people informed as the event unfolded. 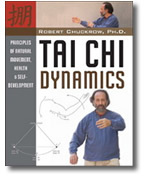 Robert Chuckrow, Ph.D. will give a Tai Chi demonstration and book-signing event at Barnes & Noble, 3105 E. Main Street (Route 6), Mohegan Lake, NY, on Saturday, May 9, 2009, at 1:30 p.m. His latest book, Tai Chi Dynamics: Principles of Natural Movement, Health, & Self-Development, will be available. This book won the 2008 USA Book News award for "Best book in Health: Exercise and Fitness category." Robert Chuckrow, whose Ph.D. is in physics and is a master teacher of Kinetic Awareness, will give a presentation about Tai Chi, which he has studied for almost four decades. He will briefly summarize the basic philosophical, health, meditative, and self-defense aspects of the art. Dr. Chuckrow and some of his students will demonstrate the first section of Cheng Man'ch'ing's short form. Finally, Dr. Chuckrow will teach the first few movements of that form to those who wish to participate. For further information, call Barnes & Noble at (914) 528-7534. Zhou Xuan Yun, the author of the Wudang Taijiquan DVD and upcoming Wudang Kung Fu Fundamentals DVD(October 09) has been invited as a guest judge for the 4th Greater Hartford International Chinese Martial Arts Festival. Master Zhou will be judging the internal arts category of the competition. The Wudang arts, which Master Zhou trained throughout his childhood on Wudang Mountain, are internal martial arts, focusing on whole body movements, redirecting incoming force, and the use of the body's "Qi" or vital energy. The Festival, which will be held on May 9, 2009 in South Windsor, CT, will be hosted by the Foundation for American and Chinese Cultural Exchange, Inc., along with the Shaolin Wushu Center, the Connecticut Chinese Culture Center, and the Zhejiang Wushu Association. Tournament divisions include Kungfu, Wushu, and Taiji, and are categorized by age, gender, and experience. Grand champion awards will be given for the following categories: men's contemporary advanced adult gongfu, women's contemporary advanced adult gongfu, men's traditional advanced adult gongfu, women's traditional, advanced adult gongfu, men's internal,women's internal, and group. Each Grand Champion individual and group will receive $500 and a trophy. The day's events will be followed by a masters demonstration and banquet. Those competing are asked to register before May 2, 2009. Spectator tickets are available online or at the door. Online registration is available. More information about Zhou Xuan Yun and the Wudang martial arts can be found on his website. 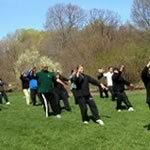 On Saturday, April 25, 2009 at 9:30 am you are invited to join a free YMAA Tai Chi and Qigong group practice at the Arnold Arboretum. Everybody is welcome to join and all levels of experience are encouraged to attend. Just bring yourself, comfortable clothes, and lots of Chi ;). Also feel free to bring your dog, kids, frisbees, and whatever you feel is appropriate for a Spring day outdoors. Please note that Arnold Arboretum has some restrictions. No food or beverages, pick up after yourself, and please care for the plant life. At 10:00am, we'll be practicing the Yang-Style Taijiquan form following the tradition of World Tai Chi & Qigong Day, a day when people all around the world do Tai Chi at 10:00am in their respective time zones. We'll also do some simple Qigong Exercises for Health and Pushing Hands. YMAA Andover will also be hosting a free World Taiji & Qigong Day event, at Yang's Fitness Center (5 Dundee Park, Andover, MA). Their event will begin at 10:15am and include Qigong, Taiji, open practice, demonstrations, and Q&A. The World Tai Chi and Qigong Day, which is celebrating its 11th year on April 25, 2009, was founded by author and martial artist Bill Douglas. The annual event will promote the related disciplines of Tai Chi and Qigong in 65 countries around the globe. There will be events in schools, towns, and cities world-wide to embrace wisdom from all cultures of the world. For further information about the event or how you might participate, visit your nearest YMAA School or the World Tai Chi Day website. Also, on Saturday April 25, join Dr. Aihan Kuhn from 10 a.m. to 12 noon at the Framingham Common in Framingham, Mass. Experience a free morning of Tai Chi and Qigong practice and see demonstrations. Dr. Kuhn serves as president of the Tai Chi & Qi Gong Healing Institute, a non-profit organization and is the director of Chinese Medicine for Health, a clinic based in Hollistion, Massachusetts, which is dedicated to healthy lifestyles through alternative and natural medicine. 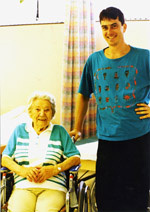 She is also author of Simple Chinese Medicine: A Beginner's Guide to Natural Healing & Well-Being. 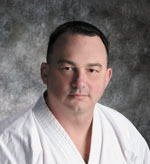 Author and martial artist, Tom Seabourne, Ph.D., has been selected as an inductee into the Taekwondo Hall of Fame on April 10, 2009. The second official awards ceremony set for 6 p.m. at the Marriott Hotel 100 Frank W. Burr Boulevard in Teaneck, N.J.
"I feel honored that I was selected into the 2009 Taekwondo Hall of Fame," said Seabourne, professor of exercise science. "Certain members of the 1979, 1980 U.S. National Taekwondo Team will be inducted." The event will include a series of daytime seminars and workshops. A prestigious group of Taekwondo practitioners and special guests will be attending from numerous countries, including Korea, Mexico, Canada, Surinam, Croatia, Brazil, India and Malaysia. Dr. Seabourne has been a two-time All-American member of the United States Taekwondo Team and a National International AAU Taekwondo Champion. He currently holds four ultra-distance cycling World Records. He is the author of Complete Cardio Kickboxing, The Martial Arts Athlete, Mind Body Fitness, and Power Body, YMAA Publication Center. The cover of Tai Chi Dynamics: Principles of Natural Movement, Health & Self-Development by Robert Chuckrow, Ph.D. , YMAA Publication Center July 2008, is a finalist for the 2009 da Vinci Eye award sponsored by the Eric Hoffer Book Award. Each year, the da Vinci Eye is given to the title with superior cover artwork. Cover art is judged on both content and style by the da Vinci Eye Committee. Final judging will be in mid-April 2009. Rory Miller, renowned YMAA author of Meditations on Violence and currently serving in Iraq as a training instructor was recently interviewed by Foreword Magazine. 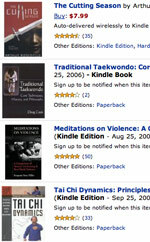 Kris Wilder is an author with 35 years of martial arts experience. He is concerned about those who need a helping hand during these hard economic times. His idea to help those less fortunate and to promote martial arts schools is innovative and worthwhile. If you haven't heard about it already in the news, the new Amazon "Kindle" has quickly become the leading e-book reading device. We have tested it and find it to be a high-quality reader. We're happy to announce that all YMAA titles are now available as Kindle editions. More YMAA titles will be added soon. The Kindle is capable of holding over 1,000 books at a time, and you can wirelessly download a book in under one minute. Of course, you can read an e-book on any device. E-books are extremely handy and are quickly gaining popularity as you can bring them with you on your daily commute, or take your training book to class. YMAA ebooks are also available on several book pages in the YMAA webstore. A new YMAA school in Western Massachusetts (Northampton), USA joins the YMAA community. YMAA Western MA will be headed by Jeff Rosen, a local Leeds resident who has studied traditional Yang Style Tai Chi Chuan with Dr. Yang, Jwing-Ming for over 18 years. Classes are currently being held at the Studio Helix (at Thorne's Marketplace, 150 Main Street, Northampton, MA 01060) on Mondays from 4:30pm to 5:30pm and Fridays from 8:00am to 9:00am. Shaolin Kung Fu classes will soon be added. They will be taught by Jamie Ishii, who used to train at YMAA Boston. First week of classes is free! After the first week, the course fee will be only $35 per month, which also covers your YMAA membership. YMAA members occasionally get additional discounts on YMAA products, special classes, or seminars. For more information please contact Jeff Rosen. Doug Cook, a renowed author of YMAA Publication Center will present a lecture at the Korea Society in New York City, a highly prestigious organization whose mission it is to cultivate understanding and strong bonds between Korea and the United States. Recent speakers have included President H.W. Bush, Henry Kissinger and Madeline Albright. The lecture entitled "Exploring the Traditional Korean Martial Art of Taekwondo" will be presented on Monday, March 23, 2009. Registration is required. For more information about this lecture visit the Korea Society. 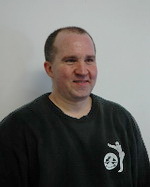 Congratulations to Mark Klein, a regular YMAA Boston Taijiquan and Pushing Hands instructor for over 5 years, for passing the test to earn his 5th Taijiquan rank. The test was conducted directly by Dr. Yang during his short visit to Boston. The 5th rank is officially titled "YMAA Taijiquan Instructor", and it is a significant accomplishment for any practitioner to achieve. Typically it takes between 5 to 10 years to reach such a deep level of Taijiquan training. Mark has been training martial arts for over 20 years and has long been a strong advocate of understanding, training, and developing martial applications, root, and foundation in the internal arts. He is also well-versed in Taiji Ball Qigong training. Aside from being a Taijiquan instructor, he is a Principal Research Scientist currently working at MIT. YMAA International welcomes its 2 newest schools, located in Clonmel, Ireland and Northampton, Massachusetts. Damian Fox has been a student at Paul Moran's YMAA school in Dublin for many years and recently decided to open the second YMAA branch school in Ireland. 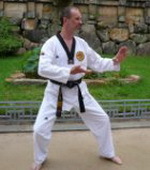 Damian will be hosting a Taijiquan school in Clonmel. YMAA Ireland has been on the rise in recent years, and we are excited that Damian has taken this initiative to expand the YMAA Irish community. 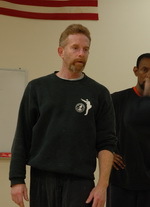 Jeff Rosen will be hosting a Taijiquan school in Western MA. He is a qualified YMAA instructor and has assisted Dr. Yang in multiple seminars in Taijiquan, Pushing Hands, and Qigong over several years. He is from one of the earlier YMAA Boston generations who trained directly under Dr. Yang, and he has been with Dr. Yang for over 18 years. Jeff is hoping to provide an opportunity for residents of Western Massachusetts who are too far away from Boston to experience and join in on traditional Taijiquan and Qigong practice. We wish Damian and Jeff the best of luck and are happy to have their schools in our community. The 2009 Winter seminar season was a great success, with many participants attending from around the world. Several people tested with Dr. Yang and moved on to their next level of certification. 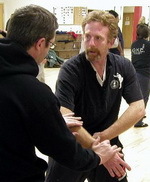 You may see photos from each weekend seminar at the Boston website. A common topic this season was Dr. Yang's ongoing efforts with the Retreat Center in California, and those interested in supporting the project may do so using PayPal for a one-time or monthly donation. Here's a recent video from the Retreat Center. Thanks to all of you for making the growing YMAA community such an excellent and diverse group. Robert Chuckrow "Best Book Award Winner"
The 2009 Winter seminar season is starting in Boston, with weekend classes on Kung Fu, Tai Chi and Qigong. Dr. Yang, Jwing-Ming will be teaching in Boston, MA, USA during the month of February. Click here for details about the subjects, and for registration details. A new video made by the YMAA Retreat Center students as their first video assignment has now been posted online. You may get a glimpse inside the Center in CA, and see clips of Dr. Yang and the five disciples training. Video footage by Craig Atkinson, narration by Jon Chang. Watch the video here. YMAA Author Achieving Guinness World Record. Again. How long would you need to train to ride an exercise bike for 185 hours? Its not a riddle; of course you can't ride for that long consecutively. If you rode a respectable 30 minutes, four days per week, you'd finish in 93 weeks. YMAA author Tom Seabourne, Ph.D is about to do it in eight days, which will make him the holder of the Guinness World Record for riding a stationary bike. Seabourne, now in his sixties, is a sports psychologist, specialist in exercise science, two-time All-American, member of the United States Taekwondo Team, and International AAU Taekwondo Champion, and an ESPN PKA full-contact karate winner. Currently the holder of four ultra-distance cycling world records and a top-ten finisher in the prestigious Race Across America (RAAM), Tom challenges himself to expand his limits and inspire others to embrace fitness, not as an event, but as a lifestyle. As Tom says it, "There is nothing more exciting than challenging yourself with a goal that seems just out of reach. Riding a bike is fun, but pedaling for 185 hours is crazy!" Mr. Seabourne is the author of the YMAA books Power Body, Complete CardioKickboxing, and Mind/Body Fitness. He can be contacted at his website.